Last updated on November 2, 2018 By Nat Leave a Comment This post may contain affiliate links. We appreciate you supporting Rags To Niches! Full disclosure here. Having a blog is such an everyday occurrence now, that everyone seems to have one… Or wants to start one. But how can you make money from blogging? Many people have no idea how people really make money from blogs and the thought of starting, can be overwhelming. Maybe you have heard about some bloggers pulling in five or six figures a year.… Actually, some bloggers make five and six figures per MONTH. That being said, a majority of bloggers still do not understand how to make money from their blogs. A majority of bloggers still make nothing or next to nothing money wise. Even when they do have some knowledge, most will not make anything close to a full time income. But it’s completely possible for anyone and there are still thousands of bloggers doing it every day. So, How Do You Do It? How Do You Make Money From A Simple Blog!? Starting your own blog or website has never been easier, thanks to the development of technology online. You can now create a professional looking blog, by tapping a few buttons. Long gone are the days when you needed to have coding knowledge and build these things from scratch. Additionally, the vast amount of ways that you can make money from your blog, are growing all the time. Perhaps the biggest hurdle of all, if you’re trying to make money from your blog, is to get your blog seen by as many people as possible. That is, to generate traffic to your blog. To do this, one of the most effective methods, is entirely free. That is to make your blog highly visible in the search engines; by using search engine optimisation, (SEO) techniques. If you know nothing about SEO, fret not – it’s actually not as confusing as it sounds and pretty simple to learn the basics, (I will tell you how further down the page!). One way to get your blog noticed is by targeting low-competition keywords in your blog posts, (keywords are particular phrases that people will be searching for in the search engines). What is a keyword in SEO? Top SEO content writing tips for beginners. To put it simply: You want your blog to capitalise on things that people are already searching for via the search engines. So, if you have a food blog – you want to be targeting search terms in your posts that people are looking for in the search engines. Best family friendly comfort food recipes. Best recipes for families on a budget. The above search terms, are all examples of long-tail keywords and are the sort of thing you may target if you had a food-related recipe blog. So often, when I’m looking researching content and checking out blogs; I’m amazed how many bloggers are clearly not targeting any keywords at all in their posts. By not doing so, you could literally be losing out of thousands of visitors to your blog every month. You don’t want to just randomly target keywords that you think may be popular, (although this would be better than nothing!). Ideally you’ll want to use a keyword research tool that can give you the data you’re looking for. Their are free and paid tools out there. A popular free tool, you can find with Google. Personally I use Jaaxy and this is now included within the wealthy affiliate membership, you can read about here. What Will You Blog About? If you found this post, then I presume you either already have a blog, or are thinking about starting one. Ideally, you already have a passion or interest in mind that you’d like your blog to be about – this will be your niche. Sticking to a narrow niche could help you get noticed sooner. Blogging in order to make money is not a quick, nor an easy road and if you’re not targeting a very particular audience, you can easily get lost. Choosing a niche: passion vs profit. How to choose a niche blog topic. You will need to write a LOT of content; so it helps if you’re interested in the topic you’re writing so much about. To get the most out of your efforts, approach your blog more like a business than a hobby. If you have this mindset from the beginning, you’ll be more likely to stick it out when the going gets tough. Although you may have great interest in what you’re blogging about, even an intense interest can become a chore to write about! So, you will need some motivation and dedication to push through these tough times. Believe me, there are times where you will really want to just quit the whole thing. This is totally normal and to be expected. What to do when you hate your blog. What to do when you feel overwhelmed blogging? 5 success stories from people who have made it online. A majority of bloggers will be making money by promoting, (or simply mentioning) other peoples products. You can connect with other companies and businesses out there and partner with them, you can direct people to their products or services via links on your website and get paid a commission if anyone buys something. This is known as affiliate marketing. 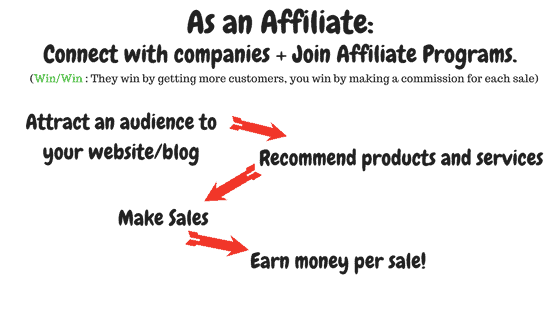 You can partake in affiliate marketing by applying to affiliate programs. If you think of any brand, a large number of them will probably have an affiliate program. To check this out affiliate programs for yourself, simply type into google the following…. 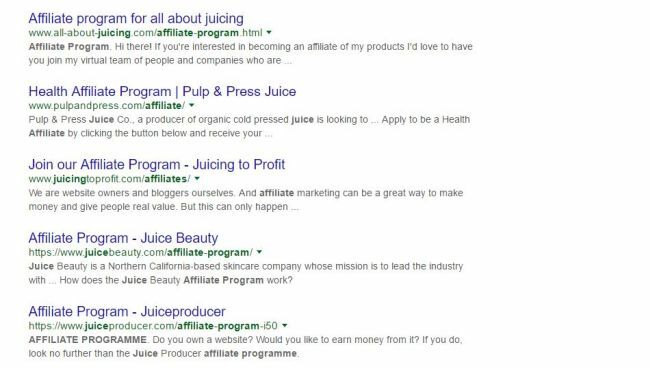 For example…if you’d like to start a blog all about how you changed your life from juicing, (pretty popular these days) – you would search: juicing diet + affiliate program or juicer + affiliate program, or simply juicing + affiliate program. If you find a good amount of affiliate programs in your niche, this is a good sign. This will mean there is a market and that your niche is profitable. If others have made money in this niche, there is no reason why you can’t too. The great thing about affiliate marketing is, you only need to suggest products or services to your reader. If they make a purchase, you make a sale. you don’t have to deal with the actual purchasing process, packing, payment or refund. You just collect a commission every time someone decides to make a purchase. OR alternatively, you may link to a separate page where you’ve written a full review, with your affiliate link within that review. The amount of commission you receive varies wildly and depends on the company. Many may pay around 3-6% – while others generally pay up to 75%. So, there is really quite a significant difference. For certain products, you could potentially get hundreds of dollars off one sale – whereas, for another, you may get a dollar or less! The best idea is to write where people are already looking. There are millions of sites and blogs out there wanting all wanting attention and all wanting to be seen – so how do you stand out? Keyword Research – Don’t Neglect It. You can then aim to reach page 1 in the search engines, for your targeted keywords. Google generally ignores content under 500 words, so try and at least write more than that per post and aim for between 1000-1500 ideally, (or more if you can). Let’s just say you wanted to write an article for your healthy eating blog about sprializer recipes. (you know those gadgets that turn vegetables into spaghetti? Very popular now!). In this case, you may want to promote your favourite spiralizer. To do this, you’d need to target a related keyword. You can look for keywords using the free google keyword planner tool. Or you could use a keyword research tool, (my favourite keyword tool is Jaaxy and you can sign up to Jaaxy for a free trial, which is well worth doing to have a play with it!). “best veggie spiralizer” has 217 exact searches a month in Google – this could be a good target long-tail keyword to use as a title for a review post. As you can see above on the table, the QSR, (number of competing pages for this keyword) is 33, (the lower this number is the better, for really low competition, under 100 QSR is best if you’re starting out). The KQI, (keyword quality indicator) has a green circle for GOOD and the SEO score of 94 is also very good, (closer to 100 the better for SEO score). By checking out keywords like this, you can get ideas for content and see what keyword would be most popularly searched for and potentially bring you the most traffic. Of course, you also need to take into consideration competition for your keyword. Check out your top competition for your keyword directly, by typing it into google. See what the top results are… do those top results have the keyword in their title? Do they have a lot of social media shares? Could you write a better post? For example, if the first page is filled with big authority sites, (sites with lots and lots of content that are dominant in their niche) you may want to choose a slightly less competitive keyword. Affiliate marketing, as we’ve covered. PPC – pay-per-click ads, (e.g. google adsense). Ads on your website, (I’m currently with Mediavine!). …and that’s just a selection of ways! So, in answer to the original question – YES – plenty of people can and do make money from blogging. A majority of people don’t make any money from blogging. But in a lot of cases, this is because they don’t understand the process. They also often don’t help themselves generate enough traffic to their, because they completely ignore SEO. The best way that you can get started and learn how to make money from your blog, is by joining a community of like minded people that are in the same boat. For example, I am a member of a large online community, which is essentially a training platform. There you can learn how to build a blog/website in any niche you choose and you learn how to drive free traffic to your blog. Once you have traffic, you can start to make money with your blog – traffic is key! If you’re interested, you need to check out this training*... Which is free to check out! Don’t Just Think About it…. Get started! I spent over 15 years thinking about blogging, before I actually committed to it. But do wonder where I’d be now if I’d started all that time ago! Don’t be that person who just wonders about doing things and never acts on them! Before you know it, many years have come and gone – and you’re still there at square one. Start today and make it happen!